You are here: Home / News / Zahra Ashrafi finishes 2nd fastest woman – Next stop Tehran. Zahra Ashrafi finishes 2nd fastest woman – Next stop Tehran. Zahra Ashrafi has just successfully completed a 100K herculean feat to raise funds and awareness for OMID. 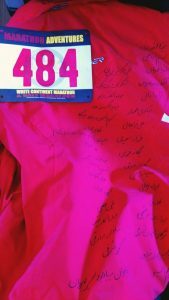 On her red jacket she wore the names and messages of her donors in Persian calligraphy created by her friend Dr. Vahid Behravan, as she ran these White Continent Marathons. 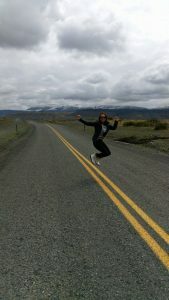 We caught up with Zahra Ashrafi shortly after her safe return to the USA, following her end of January and early February back to back 50K ultra-marathons in Antarctica and the Chile. What went through your mind at the starting line as you set off on your 100K? After months of planning, days of waiting in anticipation of if the weather would cooperate to fly out and not knowing until we landed if it would happen as planned, I was elated when they announced START! It was an adrenaline rush as we set off. How did you find the climate and terrain in Antarctica and Chile compared to previous marathons? Punta Arenas Chile is EXTREMELY windy. The course was along the coast of the Strait of Magellan where the Atlantic and Pacific Ocean meet. While prepared for anything,we were lucky to be blessed with very little sprinkles of rain, sunlight and the wind on our backs for most of the race. Antarctica is a place where the weather changes quickly and constantly. Upon landing there was a hail storm and light snow, which quickly subsided as we walked with our gear 2 miles to set up our camp. Due to the conditions being very favorably, it was decided to set up the race an start immediately upon arriving at the start destination. 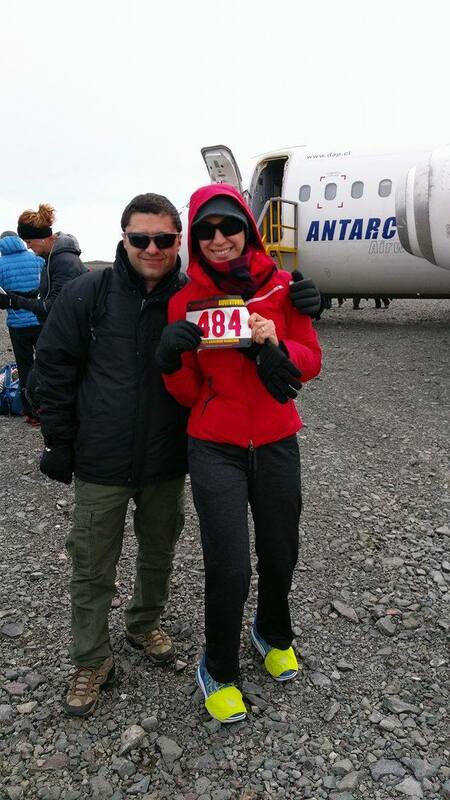 Due to it being summer in Antarctica, there was sunlight and melting snow forming small streams we crossed as we ran. The terrain was very hilly and made up of mud, gravels, river rocks and skull-sized boulders. With little more than moss, coastline, snow, ice and rocks, the landscape was otherwordly. The penguins that stood by and observed us human running back and forth were clearly amused, and I managed to videotape one penguin that decided to run with the humans! What motivated you/kept you going during each race? I thought of the girls I was hoping to help with this fundraiser, the girls I saw in the Glass House documentary, particularly two sisters whose spirit struck me. I thought of my sons, particularly when I passed a rock with red Chinese carving and the date of my eldest’s birth, I saw that as a sign! As any mother who has given birth knows, it is the most difficult and most satisfying things you will ever do, so was this race. I thought of all of my amazing donors who were inspired by my endeavor to donate to OMID. I thought of every difficult experience I had endured in my life and how time and again, every difficulty we put ourselves through and overcome makes us that much stronger. Other runners encouragement helped as we passed each other and cheered each other on. I had the opportunity to witness one of the most romantic gestures I have ever seen at the moment I needed inspiration the most from a couple who has been married 43 years. The husband had attempted this race 3 years ago and broke his wrist at mile 20 of the race and was forced to quit. Antarctica was his last continent and he had almost given up hope, but his wife encouraged him to come back. He was slow but steady, and as we were running the last mile and were exhausted I saw his wife-not a runner- come to his side, grasp his hand and whisper encouraging words to him until they crossed the finish line. I also had the opportunity to run alongside a 70 year old survivor of the Vietnam war, who still had shrapnel from a grenade in her body, a man who survived Nazi-occupied Poland as a child during WWII run alongside his daughter. My biggest cheerleader ended up being an Afghanistan-Iraq war veteran who had completely 5 tours of duty and overcome disability from war wounds. He was twice my size and turned out to be the most gentle soul in the group, calling me his hero for doing 2 50Ks back to back and smiling throughout. How did you do time-wise? We were given a cut off time of 10 hours for the race regardless of distance run, as there were 21k, 42k and 50 k runners. 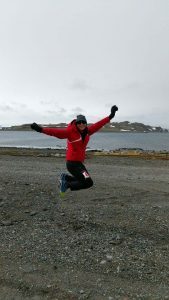 I finished 2nd female in both 50K races with a time of 8hours,19 minutes in Antactica and 6 hours 42 minutes in the Punta Arenas race. 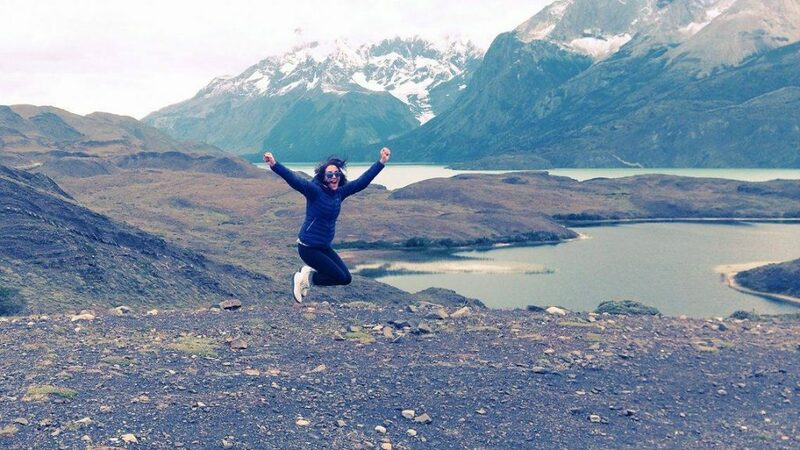 From your photos it appears you seem to like jumping – How on earth do you get the energy to jump after 100K ? I am usually so elated and my legs are numb from racing that I can not help but jump for joy up crossing a finish line! What do you do to recover from such a feat? How long does your body take to recover and how long before you run again? I recover pretty quickly and am usually running a few miles the next day to keep my muscles from tightening up. Lots of water, electrolyte tablets and Chia seeds mean I have little or no soreness afterwards. When are you arriving in Tehran and what are your plans when you get there? With the current situation in the US with regards to Iran, I am a bit nervous, but almost more motivated than before to show the world what an amazing place Iran is, and how welcoming the people are. I plan on arriving in early April, in order to have a chance to meet the young women at OMID Foundation. I am so happy to have Iran be the place where I finish my 7 continent marathon quest, crossing off Asia. I dreamed of this opportunity before it was a reality and am so happy to see it come to fruition. I will be running alongside an amazing group of strong women I have met, and will have my father cheering me on. Afterwards I am hoping to visit a few places in Iran I have always dreamed of visiting including Persepolis. Over $6,000 has been raised by Zahra, who will be continuing to raise funds for OMID from her race in Tehran. Please support this fundraiser today. Click HERE TO DONATE. To read more about Zahra and why she chose to support OMID CLICK HERE. We’ll continue to report on Zahra’s fundraising activities here and on our Facebook Page.